Wearing heels at work and spending weekends in flip flops wreak havoc on my feet and with massages far and few between, it was time I tried an at home remedy. The UComfy Shiatsu Foot Massager ($194.99 + free shipping) is ready to use by just plugging into an outlet. It is pretty small in size (17.7 x 15 x 18.1 inches) so that you can store it discretely in the corner after using. The sleek design is also appealing. Just slip your feet inside (you can put bare feet in if you like because the cloth cover is washable) and turn the power on. 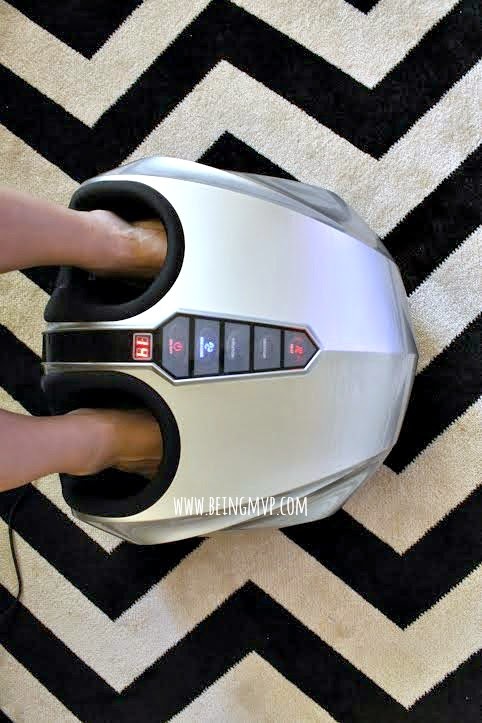 This foot massager works the top and bottom of your feet and the heat is an added bonus. You can also adjust the intensity for those who need a deeper massage. I love that there is an automated timer of 15 minutes so you can use this everyday for relaxation. You can, of course, time it for a higher duration but since I have 2 little munchkins to watch, I have to limit my time. Mason was so curious and wanted to stick his feet in but I had to keep his piggy toes away from it because this is mama's little toy. The Shiatsu kneading is not too strong but not weak either. 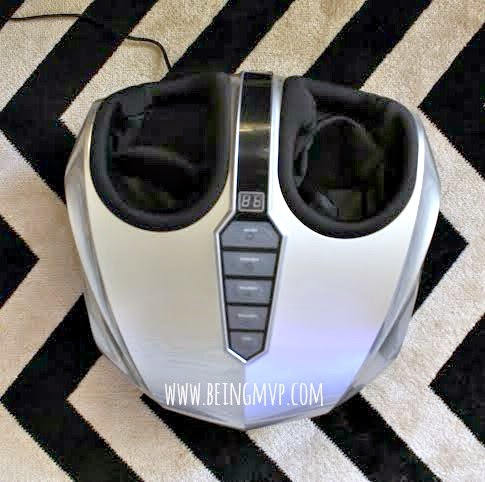 I know that my mother has tried many different foot massagers and I was excited to tell her about the uComfy foot massager and how easy it is to use and the amazing feeling after just one use. When you are tired and your feet hurt, just slip them into the uComfy and let it work its magic. I sit on the couch after dinner and slip my feet in and my feet are comfortable and my mind is calmer than usual. A fantastic feature is that it is portable so you can take it anywhere you need. Don't waste your money on constantly trying new foot massagers that will disappoint you. Check out the uComfy Shiatsu Foot Massager and your feet will thank you! I like that it improves respiration and regulates blood flow and blood pressure and that it Massages top and bottom of foot. I need me one of these since im on my feet most of the day. OMG I would never get off my couch again! This would rock! I could really use this after a long day of walking! I love that it has a timer. This would be so wonderful! I have arthritis in my feet and they stay cold all of the time! This sounds really nice. Thank you for the review! I could definitely use one of these. I think my husband and I would fight over this every night. I could definitely use one of these. Me and my husband would fight over this every night. It seems to be very comfortable and relaxing.I always prefer home foot massager because going for massage at spa or saloon is so tiring specially for busy men like me.So home foot massager is my first choice. Now we can easily take care our feet like spa by best foot massager brand. It's very easy to use. My old grandfather and grandmother can use it easily. After using it they feel so much peace in their feet. There are many high-tech foot and leg massagers out there, but with the high technology comes a high price tag. So I am having some cheap rates foot massage's also its review, visit my blog for more information.